Subtitle: I will blog about whatever I like, please and thank you. As far as decorating my bedroom goes, I’m pretty big on colour. Want to know how big? Here’s a picture of my room at my parent’s house, painted circa grade 10. This was also the time when I took embarrassing, myspace shots like this in said bedroom. You know you did it too. See that green blazer? That’s my high school band jacket. See the purple scarf? I wore that yesterday. Coolest kid in school, clearly. DO NOT TRY THIS AT HOME EVER. The one perk to moving halfway through high school? I got to paint my room two different colours. My brother picked black and red. Logically, I did what any colour-crazed teenage girl who had been living in a baby blue bedroom for the last seven years would do, and selected pink and yellow to go along with my already-lime green laden future room. Bless the girl who lived there first for picking such an atrociously bright colour. So back to my first statement: I like my room full of colour and creativity. With such, you can only imagine my excitement when I discovered this frame at a design boutique in Vienna. I knew that the second I got home I would recreate it. And it was so easy. This was all I needed. This craft project was also simplified by the fact that I had in my possession a decently sized saw. It was in the toolbox my dad bought for me in second-year. This being said, shouldn’t every 20-something girl own at least one saw? Craft projects must be taken into consideration. Now, since pencil crayons and their resulting shavings come out looking quite artistic, ensure that you take several pictures of both during and after the crafting process. Then base the front of your future business cards around one of the photos you take. This is very important. Before you know it, voila! You will have a ridiculously childish, Viennese inspired frame to help brighten up the already ceizure-inducing colour of your room. Admire for hours. In total, this frame took about 2 hours to make, almost all of which was spent lounging out on the porch in the end-of-summer sun. I’ll post the extremely-simple instructions down below, in case you every have a desire to make a frame which will most definitely make you look like a Kindergarten teacher or teen mom. Ugh. Who am I. – 1 4×6 frame with a large amount of border space. I used the Virserum frame I bought from IKEA for about $3.99, but you can find these babies anywhere. Using your saw, cut the pencil crayons into different lengths, sharpening either one end or both, for desired effect. Make sure you don’t cut them too short, otherwise you’ll have a hard time sharpening them. Seriously, I almost got a blister on my thumb from sharpening. Clearly the stamina that I built up for arts and crafts in elementary school has disappeared. Use your sanding block to, well, sand down the sawed off edge to ensure neither you nor any photo frame admirers get pricked. It’s the considerate thing to do. 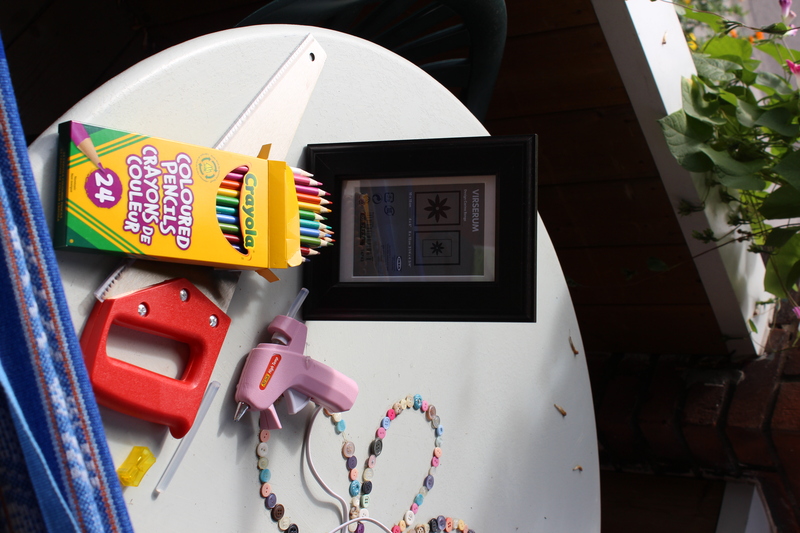 Once all your pencil crayons have been sawed and sanded, glue the pieces to your frame, one at a time, arranging them so that the maximum frame space is covered. Once the glue gunning is complete, carefully get rid of all the glue gun spider webs and stand back to admire. Toss in your favourite 4×6 photo and enjoy the DIY-wonder of this easy homemade project. Haha, oh but I don’t :( I DID consider keeping all of its forest green glory for awhile, but eventually decided to turn it in at the end of the year. Damn. And thank you!! Thanks Gord! You’ll be the first person to get one, even before my mom and dad. FYI, this is getting repinned all over Pinterest. Jessey – I saw that you “pinned” me! Thank you so much. I’m glad people like it. It was honestly such an easy thing to do and I’m sure so many people have leftover pencil crayons hanging about.